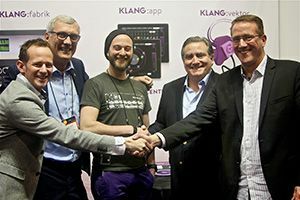 KLANG:technologies GmbH of Aachen, Germany recently appointed Group One Limited of Farmingdale, New York to serve as its exclusive product distributor for the United States and Puerto Rico. According to Pascal Dietrich, founder and chief marketing officer of KLANG:technologies, KLANG selected Group One for their active sales, effective marketing teams, and their support efforts for all of the products they represent. “We have deep relationships with both engineers and rental companies and are ideally suited to introduce KLANG to the US touring market. Additionally, we have a very active business in the House of Worship market, which we believe can greatly benefit from KLANG’s technology," said Group One President, Jack Kelly. In addition to now servicing KLANG:technologies — including the company’s core product, KLANG:fabric—Group One Limited is known throughout the North American pro audio and lighting markets as the US distributor for several other brands, including DiGiCo digital mixing consoles and Avolites lighting control desks. “This is the beginning of a strong partnership and exciting journey of forever changing the way that people will mix in-ear monitors. We see KLANG as a great fit within Group One's product portfolio and believe that the era of a silent stage begins here and now,” said Dietrich.